London Influence is a full service salon that strives to bring international caliber glamour to Portland, Oregon. Contact us at (503) 295-0342 to book your hair appointment today! We wish you love, peace, happiness, and only good hair days. London Influence is a full service hair salon located in downtown Portland. We believe that looking your best leads to feeling your best and we are passionate about helping you unlock your beauty potential. Our team of hair specialists will cut, color, shape and style your hair into the best it can be. We know a great haircut isn’t a cure-all, but sometimes it’s all it takes to take YOU to the next level. We take pride in teaching our guests about their hair and how to care for it so your good hair days continue on long after you walk out of the salon (or at least until your next appointment)! Let us show you just how great you can look and feel with salon services from London Influence. Our team of hair specialists will cut, color, shape and style your hair into the best it can be. We know a great haircut isn’t a cure-all, but sometimes it’s all it takes to take YOU to the next level. At London Influence we know that a great haircut doesn’t fix everything. But sometimes it’s all it takes to take YOU to the next level. Whether you’re looking for a trim or a total overhaul of your old hair style, our team of professional stylists are here to help. Have a particular cut in mind? Our stylists are happy to work with you to make your dream haircut a reality. At London Influence we know that looking your best often means feeling your best too. Let our team of stylists showcase a happier, more beautiful you through any of our styling services. We already know you are beautiful inside and out. Each of our talented stylists knows what it takes to unlock your full beauty potential. Hair colour is more than a statement of beauty. It’s a statement about YOU. At London Influence, we know that how you choose to represent yourself on the outside is a reflection of the inner you. Our team uses only the highest quality colouring products so your hair colour is as vibrant as you are. We’re crazy for color here at London Influence! Our team of professional stylists will help you discover the perfect hair colour for you. Give us a call to book your colour appointment today. After all, life’s too short to have boring hair! Hair styles and hair texture go hand in hand. Our professional stylists at London Influence are trained in hair texture applications to achieve the perfect hair style for you! Have a question or an idea about a hair style? Ask us! Our stylists are happy to work with you to get the look you want. We are excited to help you look AND feel your best with a hair style and texture that is as unique as you are! Call us today to schedule an appointment with one of our professional stylists. Your wedding day is one of the most important days in your life. But planning for it can be extremely stressful. London Influence is here to take some of the worry out of your wedding prep! We can’t make sure the flower girl doesn’t stain her dress – but we can make sure you look perfect for your perfect day. London Influence offers full service bridal treatment. We suggest two sessions: the first at London Influence for a creative consultation/practice run through, and the second on location the day of your event. Our stylists can be accompanied by a makeup artist and second stylist at an additional fee. Please book at least 60 days in advance. Glamorous hair isn’t just for the adults! 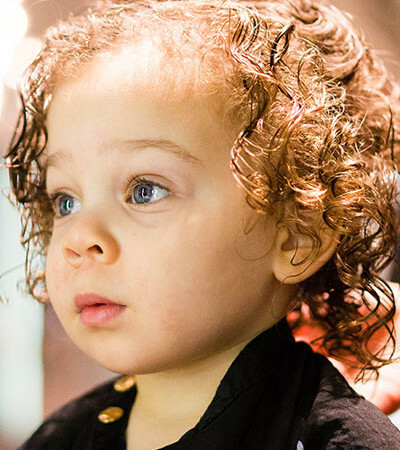 London Influence offers hair cuts for your little one(s) too. Our professional stylists are warm, patient, and love working with children. We want to provide both a great haircut AND a great experience for your child. Sarah C. has been cutting my hair for about 6 months now and I *LOVE* what she’s done with it! For a couple years now, every time I’d go into a salon, I’d explain the asymmetric bob that I wanted and would walk out with “generic soccer mom style #3.” Gross. 😛 Sarah’s listened to my requests and now I have probably my most favorite hairstyle of my life! I swear, I get compliments on it daily. 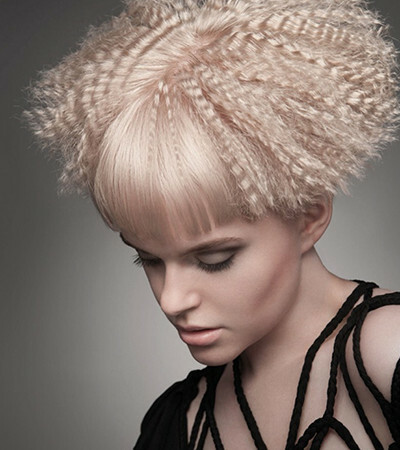 I’ve been going to London Influence for my hairstyles for years, and love Charles and his hair artistry. Charles keeps up with the latest products to help give volume to my fine hair, and I always leave looking like a million bucks. Everyone at the salon is friendly and kind, and there’s a comfy couch and tons of great and recent magazines to enjoy while you await your appointment. London Influence specializes in hair, and that is what they do best. They do cuts, color, extensions, and deep conditioning, everything your tresses need to look fabulous! The location is downtown on SW 12th Avenue, so on-street parking is pretty easy, which I love. There is also parking under the building, and the entrance is just south of the salon on 12th Avenue. If you’re coming from Beaverton, it’s super-convenient to take the Market Street exit and turn left onto 12th Avenue and go down past the MAX tracks. I wish I lived in Portland still, so Charles could do my hair all the time. I’ve yet to find a stylist in Dallas that I love as much as I love him! But when I’m here, I’m totally getting my hair done, every time! If you’re looking for a great stylist, I highly recommend Megan! She’s very nice and always gives a badass haircut/style. Kayla is amazing. I couldn’t imagine going anywhere else to get my hair done. Pricing is reasonable. I have referred a few friends who are now regulars. She knows color well, and does a great cut…. Marilyn Smith is hands down the best at blonde! When I first started seeing Marilyn my hair was thin and extremely damaged. My hair is finally long, thick and healthy again. Every time I walk out of there my hair looks flawless and natural. I swear she’s a hair magician. She has also done fusion extensions for me & ombre. My ombre turned out absolutely gorgeous, she really knows what she is doing. Not everyone knows how to pull off that perfect blend. Now when I go in I give her a general direction of what I want and leave it up to her to decide how it will look best and she always creates something more beautiful then I could have imagined. I constantly get compliments on my color. I highly recommend her and will never let anyone else touch my hair again. Marylin is amaaaaaaaazing! She is insanely talented. I will never go to anyone else EVER again! Convenient downtown location, always friendly and accommodating- Five stars for London Influence!